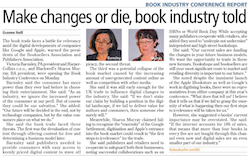 In a no-holds-barred challenge to the UK book trade reported by Graeme Neill in the Bookseller — online on Monday and in yesterday’s print edition, pictured — Booksellers Association President Sharon Murray has called for greater co-operation between publishers and booksellers. Sharon Murray said that publishers and retailers need to work together in order to safeguard both their businesses. While accepting many publishers cooperate with retailers, she added they need to “underpin not undermine” independent and high street bookshops. We should support publishers and authors in keeping their businesses profitable and helping them to reach the widest consumer market. These challenges to intellectual property and rights-holding undermine us all equally. I agree we should indeed ‘support publishers and authors in keeping their businesses profitable and helping them to reach the widest consumer market’. That’s certainly only fair and is the way it used to be and still can be. The truth is this does have to be a 50/50 relationship between us and I would like to see this happening and am glad to hear this being pushed, as has been said before can we not demonstrate our faith, ideals and commitment and be the ones to lead the way and show how it can be done?? This is really one of the ways we can work together, where publishers/producers can help underpin us instead of undermine us as we actively work to support and showcase them and retail their things to the widest possible market – letting them do the things they are best at and letting us do the things we are best at when we are not being undermined – and where all of us succeed. With all this talk in recent days of support or lack of it from publishers, I reflected on my experience with secular gift suppliers while working in the heritage sector, where you were buying personalised product quite often. On the whole, far more willing to be helpful, and quite straightforward, understandable trade terms, together with pretty accurate delivery dates, despite overseas manufacture, and correct invoices with good credit terms. Plus, of course, you could achieve good mark ups. Publishers are you really wanting our business? Next off having cleared the definition thing up of morality and ethics and the difference i’m working with, let me point out my current issue is not with anyone buying things from Online Retailers if they are real Online retailers, but if they are producers/publishers with an online retail vehicle of their own making then yep thats an issue to me. Why? it’s a fair trade and ethics thing, it’s a social justice thing to me. At the end of the day when producers/publishers do this it cuts out a whole stratum of potential employment, it breaks down the chain and undermines the ability of support and provision. On a much larger scale that in turn breaks down community at local, national and global level and causes the impoverishment of society on a massive scale. Next point then – so why do I crib about Amazon discounts etc, again it’s a fair trade issue, if you give higher discounts that enables the product to be devalued in a setting where less people are able to be employed to do the same job others can in communities all over the place then you in turn begin to break down the communities and lead to long term detriment and impoverishment. However if you operate a fair system of trading where the local communities can also sell the goods at a comparative price without detriment then you can build those same communities up without damaging the right of choice or removing the access to those not accessed by the local community. See it’s a fair trade system and issue we are discussing here and that is my only crib and the point at which I consider this to be an issue that’s bad in the secular work but totally unethical and unwarranted in a ‘Christian’ setting due to the responsibility that comes with the tag! So now on to e-books, actaully i’ve raised this point here and elsewhere many times. yes there is an ethical consideration with ebooks due to the fact that they will ahve serious ramifications on the employment front. 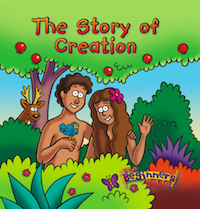 It takes less to get an ebook to market and to sell it and house it as it were in it’s supply chain than a real book. This in turn has ramifications on a local, national and global scale. we already have blanket cities & homeless springing up in places like japan and the US due to technological redundancy and unemployment in the work force – these are serious issues that we conveniently overlook and follow through on and these need to be acknowledged and dealt with. How many redundancies in our own trade have we already witnessed and are still seeing due to downsizing and ‘online’ focusing?? If we are first world/third worlding the issue then lets ask how many ebooks can you share with a third world collegue, school or community? How many books can you share? I go camping on a regular basis and let me tell you as much as I love my ebooks – and I do as I have cheerfully admitted time and time again, I’ve been reading ebooks since the late 90’s curtesy of Isilo and a Palm pilot back then! – but it’s hard to do when the batteries run out and there’s no plug socket near by. At these points the physical book is a much more worthy companion. So in answer Ian, as far as I am concerned there’s issues all round and plenty of ethical considerations we aren’t fully exploring, but is it morally wrong? not yet but I personally think if we don’t first resolve the ethics of the situation and problems raised then it soon could be, at least for those of us with the claim to be ‘Christian’. E-books and how to include indies is a topical thing – let’s hope we can come up with a good platform and idea over here too! and not drag so far behind the US as we did with indiebound and as we do with the music sales alternatives like BurnBars etc.